his disc contains material previously available on the best selling disc Music of a Nation with additional tracks that feature new arrangements of Advance Australia Fair and Waltzing Matilda. Also included is the legendary 1935 recording of Waltzing Matilda by baritone Peter Dawson. 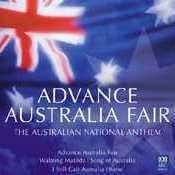 This is the definitive CD collection to be used for civic ceremonies, Australia Day celebrations or for anyone who loves the stirring sound and sentiments of our national anthem.